It is the autumn term and Greer MacDonald is struggling to settle into the sixth form at the exclusive St. Aidan the Great boarding school, known to its privileged students as S.T.A.G.S. To her surprise Greer receives a mysterious invitation with three words embossed upon it: huntin' shootin' fishin' - an invitation to spend the half term weekend at the country manor of Henry de Warlencourt, the most popular and wealthy boy at S.T.A.G.S. Greer joins the other chosen students at the ancient and sprawling Longcross Hall, and soon realises that they are at the mercy of their capricious host. 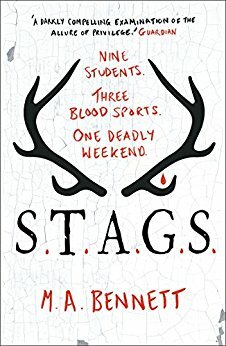 Over the next three days, as the three bloodsports - hunting, shooting and fishing - become increasingly dark and twisted, Greer comes to the horrifying reality that those being hunted are not wild game, but the very misfits Henry has brought with him from school. I've said it before and I'll say it again, young adult fiction is one of my favourite genres to read. As a general rule I find young adult books to be highly engaging, packed full of interesting themes, and a decent length to provide a punchy yet detailed story line that tends to cut out all the waffling you may find in a book for an older audience. S.T.A.G.S was no exception to this. When Greer, Chanel and Shafeen are all invited to the de Warlencourt country manor, Greer finally starts to think she may be being expected into the privileged life she's now found herself in at the St Aidan boarding school. After all she's been invited my the wealthiest boy in school and alongside him are his friends, the group make up the 'Medieval's' the richest kids of them all, made up of old money and each with ancestors that have attended St Aidan's for centuries. They effectively run the school. Accept the 'Medieval's' would never accept Greer, Chanel and Shafeen into their way of life because they're known as 'Savages', Greer is a working class girl who gained a scholarship, Chanel is from new money with a father who invented a tablet and flashes the cash on tacky cars and jewelry and Shafeen is foreign. They each represent everything that the 'Medieval's' hate and the cult like group will stop at nothing to wipe 'Savages' out of St Aidan's history. I thoroughly enjoyed this book and the way it pitted the aristocratic lifestyle of those who get where they are based on money not merit against those who come from new money or are academically outstanding. The cult like feel to S.T.A.G.S added to the thrill of the novel and the hunting, shooting and fishing definitely got the heart rate going. The novel is told from Greer's point of view and manages to be realistic in telling the story from a 16 year old girls perspective without being try hard and cringey like some YA book I've read that try to emulate a teens voice. Whilst it was very clear from the start of the novel that something terrible was going to happen, it didn't detract from the suspense of the rest of the novel. I also enjoyed that there were several twists to the story right up to the very end. I really hope M.A. Bennett writes more YA fiction in the future, because I for one would snap it straight up!